Best of the Week: Apple Music review, B&W P5 Wireless headphones and more | What Hi-Fi? A round-up of the news and reviews to have graced What Hi-Fi? this past week – featuring products from Apple, B&W, Dali, Sonoro and Panasonic. 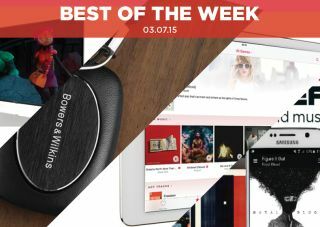 This week we heard of new releases and announcements from the industry's big hitters as B&W announced the P5 Wireless headphones, Dali teased a new Ikon loudspeaker and the long-awaited Apple Music went live. You can read our review over here. Review wise there's the aforementioned Apple Music review, as well as a trio of excellent products in Panasonic's budget DMP-BDT170 Blu-ray player, the SonoroSTEREO music system and the P55D600 4K TV from Polaroid. The week also saw the publication of the latest issue of What Hi-Fi? with the August magazine on sale in all good newsagents and online via desktop or tablet. In it are reviews of the latest in hi-fi and home cinema, with a smartphone Supertest featuring brands such as Apple, LG and Samsung; a Group Test of budget Blu-ray players and a head-to-head of 4K projectors. And if that's not enough to sate your appetite, there's an extensive feature on building an audio network and a guide on everything you need to know about DACs (digital-to-analogue converters). MORE: This month's top 10 reviews on What Hi-Fi? Earlier this week B&W introduced its latest headphone and it's a mix of the old and the new. The B&W P5 Wireless headphones sport the same design as the P5 Series 2 but, as the name implies, they come with wireless connectivity. They boast aptX Bluetooth, which on a full charge can last for 17 hours, a USB cable for charging and a 3.5mm cable for wired playback. The P5 Wireless is out now and available to buy for £330. Put the 6th August in your diary as that looks to be the day Dali announces its latest loudspeaker. In an e-mail sent to journalists earlier this week, the Danish speaker company announced it will be revealing 'a future ikon' with 'cutting edge technology, no doubt a reference to its Ikon speaker range. There wasn't much else save for a close-up of what looks to be a very glossy corner of the speaker. Stay tuned for more in the coming weeks. In case you hadn't heard, Apple has launched a music streaming service. The service went live on Tuesday with the latest release of iOS 8.4, with iTunes requiring the 12.2 update to enable it. In the app, you'll be able to access Beats 1, Apple's 24/7 Internet radio station that's now up and running and free for all users. The Music app itself is free for the first three months, and once that's over you'll have to pay £9.99 a month for access. To read more about the service Apple is calling 'revolutionary', read our review. "Apple Music may not change the way you listen to music, but it will make you listen to more music"
It's been in the offing for a while and now Apple has finally unleashed its answer to Spotify, Tidal et al with its Apple Music streaming service. Is it good? Yes, very much so. First the good bits: the music curation and recommendations are fantastic, the best we've seen from a service of its kind. Playlists feature interesting choices and its Beats radio station is a good first attempt at live broadcasting. However, we did find the interface to be a bit crowded. This feels like an app trying hard to pull together a lot of strands into one place and at times it seems a tad confusing to use. But that's a niggle. Overall it's very good indeed. Using Apple Music we've found that we listen to a lot more music than we did before – and isn't that the point? "…This is one of the best budget boxes on the shelves"
Panasonic has had tremendous form in the Blu-ray player market but it's seen fit to refresh its 2015 entry-level line up. It's a decision that's reaped dividends with the DMP-BDT170. From an aesthetic perspective it won't win any prizes. Instead it's the picture performance where the Panasonic kicks into gear with a tremendous sense of detail and contrast. Sound is not far behind in the quality stakes, and while there are plenty of apps such as Netflix and Amazon Prime, the lack of any catch-up TV apps is a bone of contention. Regardless, if that's not a problem, the Panasonic boasts a great performance for a low price. "We don’t often hear such a mature, multi-talented sound from a product of this sort"
One-box solutions are becoming popular and German company Sonoro (no, not Sonos) has taken a stab at the market with its SonoroSTEREO music system. At first glance it's an attractive looking box, the kind of hi-fi we'd like in in our home. Play a track and the STEREO offers a clear, spacious sound that's very listenable. It's not all perfect. Treble could use some refinement and it doesn't have internet connectivity but, even so, this is an all-in-one box that you should give a look. "If you can live without it [4K streaming] and want a decent-performing big TV at a good price, the Polaroid is worth a punt"
Sold exclusively in Asda supermarkets, Polaroid has made a name for itself for as a purveyor of budget Full HD sets. The P55D600 sees it setting its ambitions higher with its first 4K set. And it's not too shabby. A 4K set for £700 was always going to be compromised – there's no ability to stream 4K from Netflix – but it does have HDMI 2.0 for compatibility with the Ultra HD Blu-ray players coming later this year. For £700 this set does a commendable job, displaying images with a vibrant sense of colour, detail and definition with a strong feel for clarity, too. If you're not willing to fork out £2000 on a 4K TV, this Polaroid is a good alternative.